The 25th anniversary of the Americans with Disabilities Act (ADA) has provided museums and museum associations the opportunity to review and reflect on the ways in which visitors with disabilities can be provided with improved access to museums. Recent professional development workshops, webinars and magazine articles have shown how a number of museums have created programs that provide imaginative new ways for their visitors with disabilities to experience museums. Unfortunately, many of these ideas provide access to only one exhibit or require extensive time or money to implement. 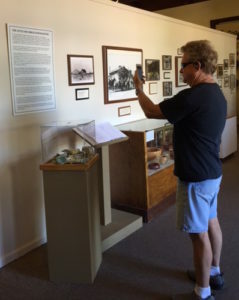 Chuck Dean demonstrates the use of the KNFB Reader app on his iPhone at the Scottsdale Historical Society Museum. This article focuses on visitors with visual disabilities for two main reasons. First, there are more than 800 diseases of the eye and they present themselves differently in different people. Some people who are visually impaired can read large text or Braille; some can’t read either. Some see better in bright light, and for some bright light totally obscures or fractures what they see. Basically there is no “one thing” that works for everyone. Secondly, the development of smart phone apps has revolutionized the way that people who are visually impaired go about their daily lives, from travel using individualized GPS directions to access to a wide range of published materials via screen-reader and OCR apps. 1 Museums are just beginning to explore how they can use these relatively inexpensive technological advances to make themselves more accessible. Put your label text (and any other written materials you have, like gallery guides) on your website in a format that can be downloaded. You’ve written it all out anyhow. People who are visually impaired can access that information in the way they find most useful. They can print it out at home as large text or Braille and take that with them on their visit to your museum. At the museum they can read it directly off the website with their smart phone using a screen-reader app. Use QR codes as part of your exhibit label to provide links to the information on your website. While QR codes haven’t been as successful for marketing as people hoped (to put it mildly), they are perfect for this purpose. In fact, in our opinion if museums were to do one thing to be more accessible, it would be to add QR codes to labels. A visitor with a smart phone can scan the code and hear the text (again using a screen-reader app). There are also smart phone apps that will scan the label itself and read it to the user. Some will even tell the user when the phone is “square” to the label and translate into one of over 200 languages. (BTW make sure your security guards know to allow visitors to “take pictures” of the label for this purpose). To make your labels and QR codes really useful, be consistent about where you place them (e.g., lower right corner of the case; 3 feet high and one foot to the right of the painting) so that they are easy to find. Using a separate standard sized frame for the QR codes would also be helpful. Ideally, all museums would agree on the same location for QR codes, but at least you can tell your visitors where to find yours. None of these solutions is difficult or expensive, but would make all the difference in your museum being accessible. Janice Klein is the Executive Director of the Museum Association of Arizona. She has worked in the museum field for more than 30 years and has served as Chair of AAM’s Small Museum Administrators Committee and on the AASLH Small Museum Committee. Chuck Dean worked as a tool and die maker until he was diagnosed with Stargardt’s disease (juvenile macular degeneration) in his early 30’s. Since becoming legally blind he has managed his own business as a licensed massage therapist. He is an avid technology-user and has been using smart phone apps to assist in his travels (and museum going) for more than 10 years. He is a regular contributor to the Apple Vis Website and ViPhone Discussion list. I have attemped to make exhibits, walks, programs and recorded interviews accessible for peoplewith all disabilities. My volunteer workers have always included students and adults with disabilities. I included students who had visual disabilities. After my resignation as City of Sun Prsirie Museum Curator these programs stopped. I am now a Board Member and Advisor for the Island Church Foundation in Waterloo Townshipsith the provision that alll students and adults are welcome as volunteers. Thanks for the names of the screen reader apps. QR codes just have not worked for us.